The Raleigh Rowdy is a 16" single speed kids' bike that appears to be an adult specced bike scaled down for kids' usage. From the modern cockpit to the mean, high volume street tires, this thing screams quality. Its curious that the first post on a blog called "Reviews of things I own" would be about a product my son owns. But you have to understand my association with this bike, and the personal connection I have to it, to realize why I feel like this is my bike too. 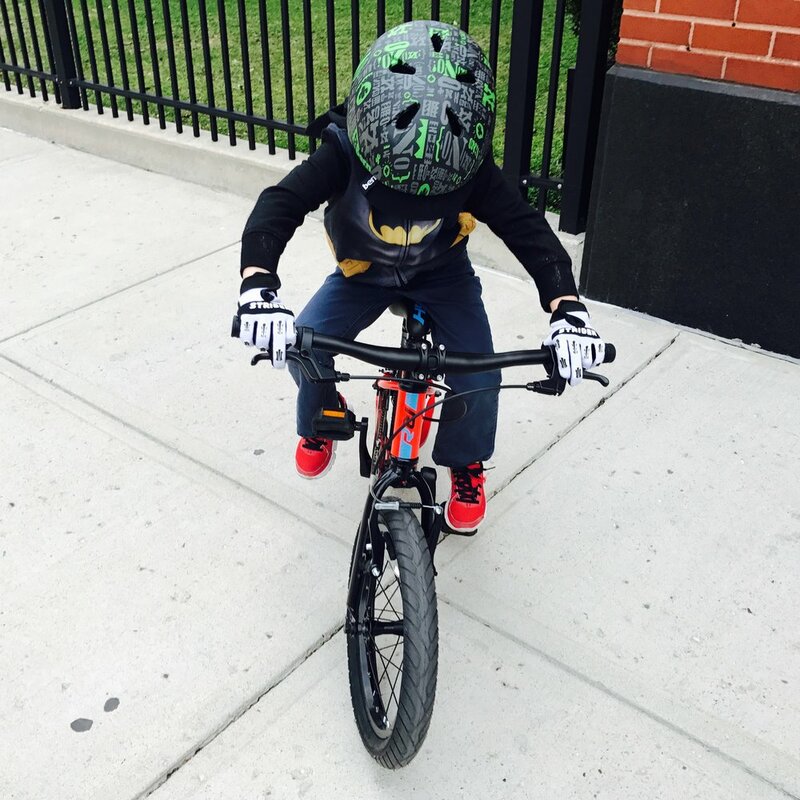 As a lifelong cyclist and bike-lover, getting my son his first bike was a ritual. A rite of passage. My net was cast wide, and my search was exhaustive. After visits to multiple bike shops, some local, some far away, some online, I came upon the amazon listing for the Raleigh Rowdy. It contained only one photo, and a fairly sparse description. From the photo alone, I was immediately taken with the bike. Here we had a bike that looked, in its geometry profile at least, not unlike a classic MTB race bike of the era in which I came to love the sport. Sized down of course, for kids. This is the official product shot of the Rowdy 16". Can I take it for a ride? What I noticed immediately, beside the frame geometry, was the dual V-brakes, and NO coaster brake. Thats right, no coaster brake. Brilliant. Not for every kid mind you, but if your kid is the variety to either get excited about being "big" or generally quick to learn, then its a nice trick to skip the coaster brake step. Coaster brakes are intuitive to learn, and can be mastered quickly. Being native on hand brakes makes one far more versatile in terms of which bikes you can ride. The mere fact that this bike has only hand brakes belies its character. This bike is, at its essence, your bike, only smaller. Next to catch my attention was the beefy 2.0" tires and black rims. The tires, with a moto-inspired style and profile that would be a neat fit on a Ducati street bike, are simply heart-thumping. Looking at the bike, both in person and in the single website image, one could easily see proportions that bordered on fat-bike territory. The sipes are aggressive, and again, heavily moto-inspired. The thickness of the rubber on the contact patch looks ample, meaning tire life should be pretty good. For longer tread life, swap them front to back if wear becomes excessive on the rear tire due to skidding. Typically bikes with v-brakes have machined rims, but these were black, similar to disc-brake rims. Turns out the rims are painted but with a finish that makes it hard to distinguish from anodized. Truthfully, its hard to tell for sure, which is a testament to the quality of the job. The v-brakes have, naturally, worn through this coating, but the look is still good and the scrape marks from the brake pads are much less noticeable than I suspected they would be after a few months of riding. Singlespeed chainring with unobtrusive (and removable) chain guard. The cranks are a little short, but I suspect thats a requirement for the low bottom bracket height. The drivetrain of the Raleigh Rowdy is signespeed with nice looking chainrings and cogs. The quality is in line with expectations of an adult bike of bike store level quality (not Toys R Us). The crankset is possibly the weakest link on the bike, featuring lots of plastic and short crank arms. Looking at the bike in motion, its easy to see why they are so short, as they would strike the ground during cornering if they were longer. Rest assured, however, these parts are all upgradable, especially the heavy and bulbous plastic pedals. A nice set of small sized $30 amazon CNC pedals from Chinese manufacturers (direct to consumer) would make a sweet and affordable upgrade, if needed. The operation of the drivetrain is smooth and tight, with a burly chain and no wobble, looseness or friction perceptible in the chainline. They just went ahead and used regular bike parts on this kids bike. The frame of the Rowdy 16 is beautiful. The craftsmanship is directly in line with that of Raleigh's main line frames. The design and attention to detail in the frame is also nice. The reinforcement at seat-tube/top-tube junction reminds me of some legendary Santa Cruz XC race bikes, and the overall geometry looks eminently huckable. Note the height of the head tube and resulting fitness of a flat XC-style handle bar. Very cool. Most of your kid's peers will be up on BMX style handlebars on a similar bike frame. Yours will be low and wide with long wingspan flat bars and short stem. Wheee! This bike is begging to be pushed to limits far beyond anything a kid could dish out. This is exactly the position you want your child in when they are learning to ride a bike. Wide, stable grips and a low chassis with manageable stand-over height. The general component quality level is good, for an adult bike, and great for a kids bike. Brakes are strong with cute levers that mimic adult sized XC levers well, but miniaturized. They have really good leverage for small hands. V-brakes were the hardest part for my son to master, but I adjusted the brakes very carefully, completely disassembling and reconstructing them for optimum calibration and tension, and it helped a lot. The most helpful change was moving the tension spring pin in the v-brake to the easiest hole in the three hole selection at the brake bosses. To access this you will need a hex wrench to remove the brake boss bolt, and then the spring can be re seated in the 'easier' hole. Videos online show this process step-by-step. The saddle has a cool logo design, but a generic shape and husky build. Its fine, even cool from a certain persoective. Standard rail spacing makes upgrading easy. Hardware is mostly hex wrench bolts and similar tools to what would be in a basic bike repair kit for a quality adult bike. Nuts are used for the wheels, not quick releases, but hey, are pegs far behind? All clamps are nice quality and designed for light weight. You could swap most of the parts of this bike to your own bike, as ill fitting as they would be in use. Match made in heaven. Or on Amazon. I would recommend that parents of kids who are interested in cycling buy this bike. It retails for about $220, depending on sales, and I think its well worth it. A 4-6 year old can get a lot of use out of this frame and wheel size, and one should not be concerned about "growing out of it", and getting a larger 20" bike for a similar age range. The first years of riding are critical to cementing one's love for the sport. Having a small, manageable frame creates the mental framework for dominating the bike, and not the other way around. My son got this bike for his 5th birthday, and I think he can ride it comfortably, with seat and handle bar adjustments, for at least another year, at which point his sister will get the pleasure of ownership. This would be a great bike to graduate to from the Rowdy, at about twice the price. But...just look at it. ← GORUCK GR1 (GR0) - A rock solid backpack made to hold solid rocks. And your Mac.